China is simply a marvel from every aspect. It is the 4th largest country in area in the world and the 4th most visited country by foreigners. Chinese culture dates back almost 5000, possesses the richest heritage, the most mouth-watering cuisine, and extremely friendly people. Take a look at these facts and see if you can resist the urge to visit China. The very first interesting about this gargantuan nation is that 50% of the total Chinese population live in the rural areas despite only 10% of the total land area of the country being arable. China is the oldest continuous civilization. It has the largest number of UNESCO World Heritage Sites after Italy and Spain and a single time zone is spread all over the country. Ice cream and Pasta originated in China and were introduced to the Western countries by Marco Polo. You will be astounded to hear that the high speed trains traveling from Beijing to Guangzhou and Shanghai reach a speed as high as 430 kilometres/268 miles per hour. Facts may be described in words but the beauty of China is simply inexplicable. As the saying goes, ‘if you want to know it then experience it’. This couldn’t befit China more. Well, when you have finally decided to actually visit China then Beijing is where you should head first. It awaits to serve you the Great Hall of People (the seat of government), the entrance to the Forbidden City/Imperial Palace which is a city within a city with 9999 rooms spread over 250 acres. 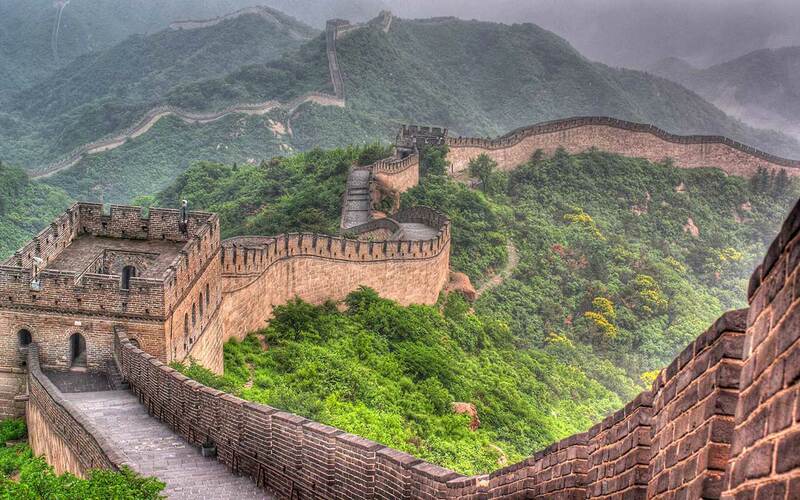 An amazing view of a part of the Great Wall of China can be seen from Beijing. Another marvel in Beijing is the exquisite structure of the Temple of Heaven where the emperors used to worship dating back to the 15th century. The Ming Tombs, nearby the Great Wall is where these emperors were buried. The Suburban region in Beijing portrays a placid lake on which is moored the only boat made of marble in the world. The ‘Bird’s Nest’ Stadium and the ‘Water Cube’ Aquatic Centre are other landmarks that draw big attention. Next comes Shanghai. Having excelled in the aspects of economy, culture and technology, Shanghai maintains the biggest influence throughout the Eastern China. The Bund, Peace Hotel, Nanjing Road, the Jade Buddha temple, and the 16th Yu Yuan Gardens which is a maze of colourful ponds, pavilions, stone dragons, trees, and a zigzag bridge. Having witnessed Shanghai, Xian is what comes next on the list with its fascinating ruins, museums, and relics. What will surprise you is the excavation of the famous Terra Cotta warriors which is an army of 8000 life size soldiers, 600 horses and over 100 chariots, all amazingly discovered from underneath the ground. Gulin is yet another country with mesmerizing landscapes of places like trunk Hill, Seven Star Park, and Reed Flute Cave. Also the view of the brilliant limestone rock formations from the cruise on the Li River. In Guangzhou, things you wouldn’t want to miss are the Canton Trade Fair in April and Novaember, Canton Tower which is the 5th tallest freestanding structure in the world. Chigang Pagoda, Shamian Island and Yuexiu Park are some other popular sites at Guangzhou. Similarly, the Grand Canal and silk factory in Suzhou. Other places like Hangzhou and Kunming have consistently received the spotlight for their beauty and one can simply not miss the Chengdu Panda sanctuary. And how could you possibly not visit Tibet huh? Tibet is an autonomous region with Lhasa as the capital and is one of the highest cities in the world (3500m). The former residence of the Dalai Lamas is the Potala Palace which is a spectacular building mounted on top of a hill towering fortress-like structure over the city going as high as 13 storeys with 1000 rooms! Jokhang Temple is yet another pilgrimage centre, the Sera Temple is home to around 600 monks. Barkhor Square is another magnificent site with displays of iridescently dressed people. And at last but definitely not the least, the Yangzte River and its cruises that take you to the largest dam producing hydro-electricity in the world.